Hero Defense King is a new TD/tower-defense game for mobile devices. The gameplay is similar to other tower-defense games. But it is not ruined by the energy system. It features amazing heroes, towers, skills, add-on boosters, and much more. And you can easily obtain gold/coins by playing the game. As of now, Hero Defense King game features 50 levels. You can play each stage in three difficulty modes; story, challenge, and hard. The amount of reward varies. First of all, the player has to complete story. Then challenge and after it, hard. After completing a set of stages(in all difficulty modes), you will be rewarded with a huge amount of reward. Set of stages? -> i.e. -> 1-5, 6-10, 11-15, and so on. 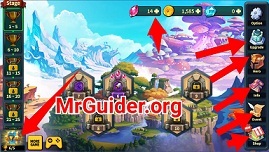 In this post, we have covered everything about the game you need to know; Hero Defense King guide and Hero Defense King cheats, tips & strategy guide. Before we dive into the cheats, tips & strategy guide part, let’s learn the basic of the game. In Hero Defense King game, your objective is to complete all the stages(in all modes; story, challenge, and hard). All you need to do is place the towers on the right spot, upgrade towers, use skills, and heroes wisely and strike down the enemy team before they surpass the defense. Initial levels are very easy, but later it becomes more difficult. Only the best strategy leads you to the victory. As of now, the maximum level of all the tower is 4. But you can not upgrade it to level 4 in initial stages. And you can also use skills, heroes, and add-ons in the battle to get the victory. 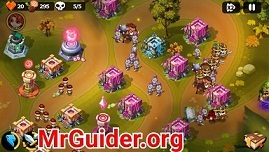 Let’s start the Hero Defense King guide and after it, check out the Hero Defense King tips, cheats & strategy guide. In this part, we will learn about towers, skills, add-ons, heroes, dwarf, modes, gold coins, diamonds, stone, and much more. The maximum level of barrack tower is 4. Upgrading the barrack tower increases the stats of units; HP, Attack, and defense. If you upgrade the barrack tower to level 3, then a special buff will activate; Air Shooting(If you choose commando). Maximum Level -> 4. Special Buff gets activated when you upgrade it to level 3 in the battle[If you choose evergreen]. Cannon Tower deals damage to the enemies from a range. Barrack Tower produces units. These units can easily stop the enemies(who are fast). On the other hand, towers like the arch tower, cannon tower, and magic tower cannot stop the fast enemies. When you upgrade the barrack tower to level 3(commando), air shooting gets enabled. Magic Tower’s attack power is better than all the towers featured in Hero Defense King game. And by deploying the magic tower on the battlefield, you can easily slay down the air-type monsters. To upgrade the tower, just tap on the tower and hit the upgrade icon(it costs you wood, wood can be obtained by slaying down the enemies). On the main screen, at the right side, tap on the upgrade option. Then choose an upgrade type and confirm the upgrade. For instance, there is a strengthening recovery upgrade available for the barrack tower and it can increase the HP of all soldiers. It costs you stones and gold coins. Stones can be obtained by playing the game; just tap on the + icon next to stone icon at the top of the screen; then play the recommended stage. In the battle, at the left-bottom corner, tap on the skill icon to deal damage to the enemies. You can increase the stats of skills and reduce the cooldown time by upgrading. 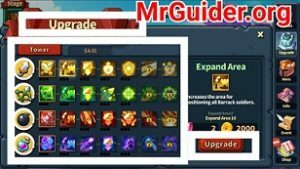 Go to the upgrade tab -> head to skill -> select an upgrade -> confirm. In Hero Defense King, the first hero is Amanda. In the battle, you can manually place hero; hero attacks automatically. You can use the hero’s skill to deal more damage. Hero’s level increases on the basis of the number of kills. You can upgrade the hero using food. Food items can be obtained from the chests. Go to the main screen -> hero -> head to growth tab -> select the food item -> and tap on the eat food button. It costs you gold coins. Go to the hero info tab -> on the right side -> there is a paratrooper option -> tap on it. As of now, there are four units; guard, soldier, centurion, and knight. New units get unlocked as you progress. You can upgrade these units to improve the battle performance. You can deploy these units using the skill in the battle. You can obtain gold and stones by playing the game. Diamond is a premium currency, used in buying combat items; bomb, wood supply, and missiles(go to the shop). You will get the diamond as a reward(daily reward, events tab). So, this is the basic Hero Defense King guide. Let’s start the Hero Defense King cheats, tips & strategy. The very first step you have to do in the battle is to check the route(find the skull image). If there are multiple routes, then find the right spot(center of multiple routes), and deploy towers there. Since you have limited woods in the battle, you have to lead wisely. There are lots of monsters featured in the Hero Defense King game. Some are slow, while some are fast. To stop the fast enemies, you should place barrack. Because other towers are of range type and monsters with high speed can easily dodge their attacks. So, make sure place barrack first. Magic Tower -> Place it near the barrack. The attack power of magic tower is best as compared to other towers. Make sure to upgrade the towers at the right time. Upgrading the tower increases the stats. Just tap on the tower you want to upgrade and confirm. It would be better to balance the upgrade; barrack, magic tower – both. To stop the enemies, upgrade leading towers first. You have two choices at level 3. Make sure to choose wisely. Go to the main screen -> info -> tower – select the level -> at the left side, you can check the difference b/w these two choices. Hero’s main skill activates after a certain amount of time and deals a massive damage. You should use that skill when there are a huge number of monsters around you[to get most out of that skill]. You can also move the hero; just tap on it and then tap where you want to move it. It would be better to move it to the front side[if there are multiple incoming routes, then deploy it on the center of these routes]. Use the hero’s skill at the right time. Upgrade the hero by feeding them(read the hero guide above). As you know, gold coins are used to upgrade heroes, towers, and skills. To get more gold coins, simply play the hard mode(because the amount of reward is high). Repeat the levels again and again.